Support > XSplit Gamecaster > Frequently Asked Questions > General > Does XSplit Gamecaster work with game consoles? 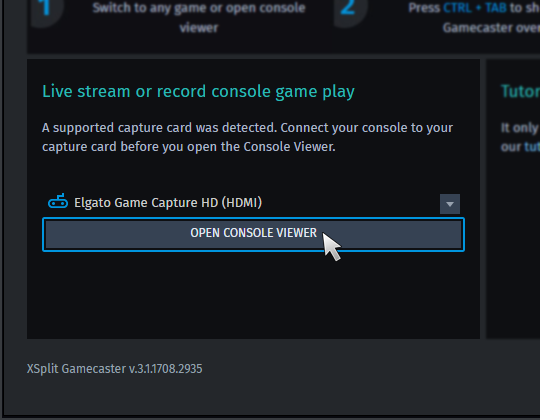 You can use XSplit Gamecaster with your game console through the Console Viewer and one of the supported capture cards/devices. Just connect your game console to your capture card, then your capture device to your PC and XSplit Gamecaster will automatically detect your device. Click on OPEN CONSOLE VIEWER to start capturing your console gameplay. Future updates will add support for more capture cards/devices.